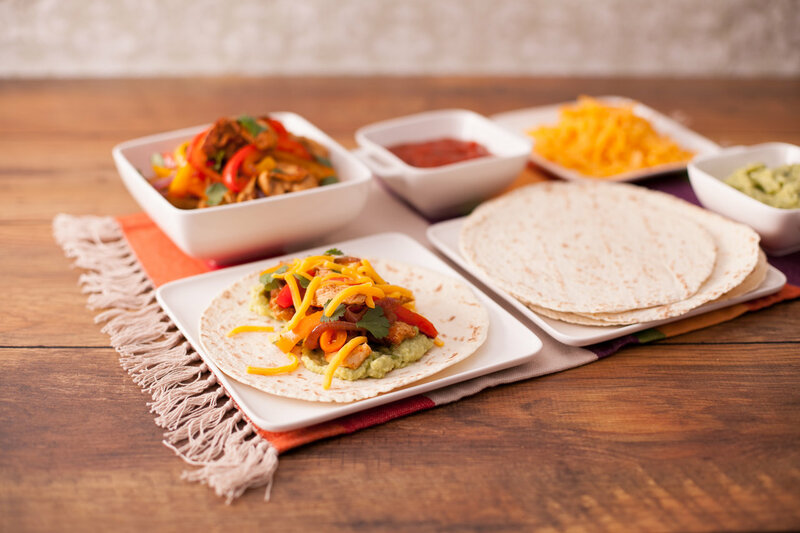 Chicken Fajitas make a delicious and versatile meal. Lunch with a group of friends at the weekend or a quick to make mid-week dinner. 1.Toss the chicken with the lime juice and a large pinch of salt. Leave to marinate in the fridge. 2.Heat a large pan on medium heat with a dash of olive oil. Once hot, add the onion, bell peppers and half of the fajita seasoning. Cook, tossing occasionally, until vegetables have softened but still have a bit of a bite. Spoon into a dish, cover with foil and set aside. 3.Increase heat to medium high and add another dash of olive oil. Once hot, add the chicken with the remaining fajita seasoning and cook the chicken until golden and cooked through, about 5 minutes. Add the cooked peppers and onion back into the pan, toss to mix and cook for about a minute, just to heat the vegetables. 4.Remove from the pan, strew with chopped coriander then serve with warmed tortilla wraps and other fajita favourites like cheddar, guacamole, salsa and sour cream. This is one of our favourite student recipes as you can make an impressive meal without too much of a fuss!